Power Control Inaccuracy in CDMA why power is always change in cdma how power control in cdma forward and in reverse direction. CDMA means all depedancy on power control here i write on Power Control Inaccuracy in cdma. Traffic capacity of CDMA systems is increased by implementing an appropriate power control scheme to equalize the performance of all subscribers in the system. The appropriate power control scheme reduces the interference to the other adjacent cells. The less interference generated in the spectrum, the more users the CDMA system can support. As previously mentioned, the inaccuracy in power control is roughly a log-normal distributed function. Under different path loss situations, the average required Eb/(N0+I0) tends to fluctuate around the mean to maintain a desirable Frame Error Rate. The power control standard deviation varies according to the extent of fluctuations. 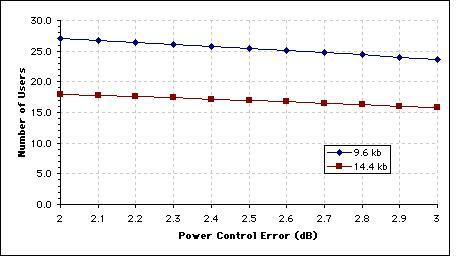 This graph shows that improving the accuracy of power control can provide some increase to the number of users. At relatively slow speeds or in static conditions (fixed), power control is effective in counteracting slow fades whereas at high speeds power control is not as effective in counteracting fast fading. At higher speed, the effects of interleaving become increasingly beneficial. 26 queries in 0.376 seconds.